The bus left Seville at 8:15 this morning. It was over two hours before we made a rest stop, another followed about two hours later for lunch. 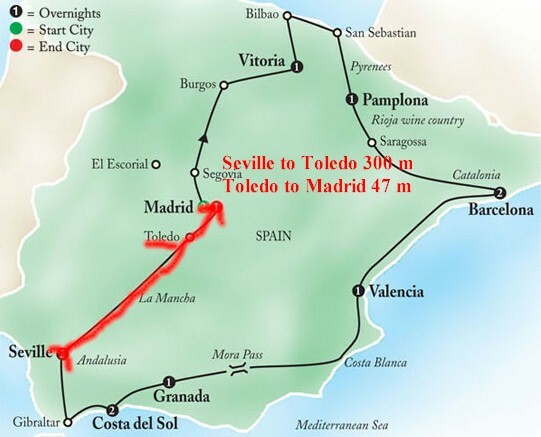 It was 300 miles from Seville to Toledo. Our first stop in Toledo was at the Damascene Steel Workshop. We were given this big sales pitch by our guide on the fine items that would be for sale. We were to have an introduction to the art of damascene and then a demonstration by one of the craftsman. We never got the demonstration as he was away from his bench the whole time that we were there, but the sales force in the show room was ready for the attack. They did have lovely things, and we bought several gifts. 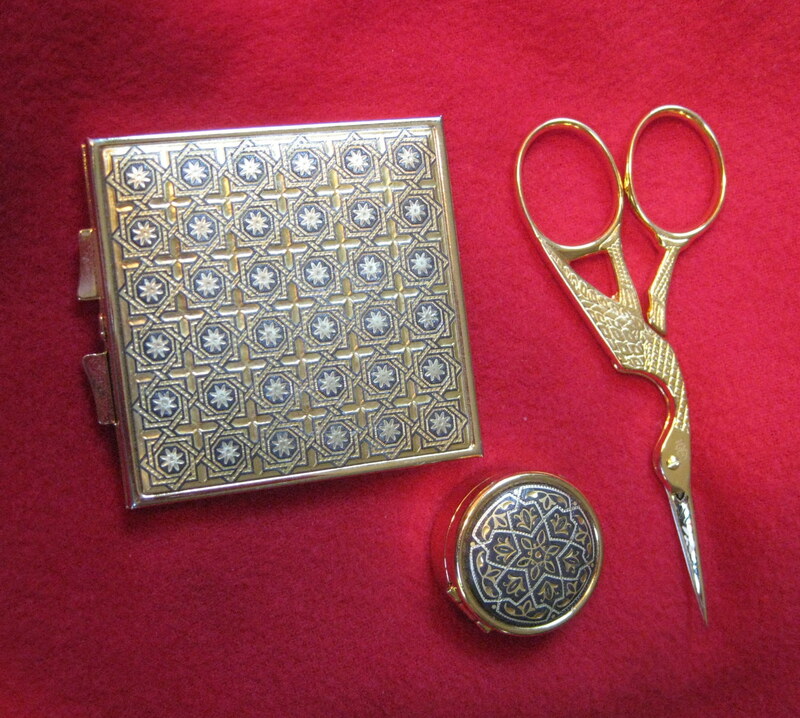 I got a pill box, and my wife bought some scissors shaped like a stork, and a compact mirror. We arrived at the bottom of the hill in Toledo where our city guide met us. 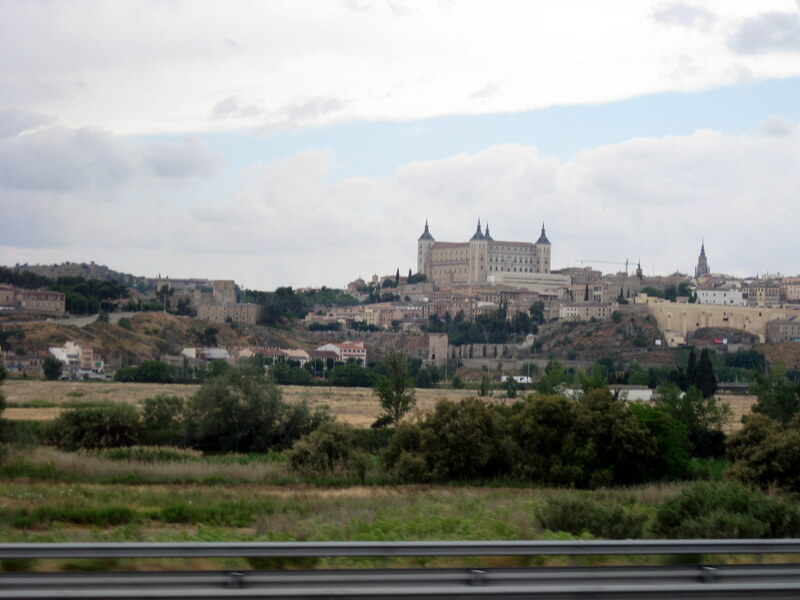 Surrounded on three sides by a bend in the Tagus River, Toledo stands atop a hill overlooking the arid plains of New Castile -- a natural fortress in the center of the Iberian Peninsula. It was a logical choice for the capital of Spain, though it lost its political status to Madrid in the 1500s. 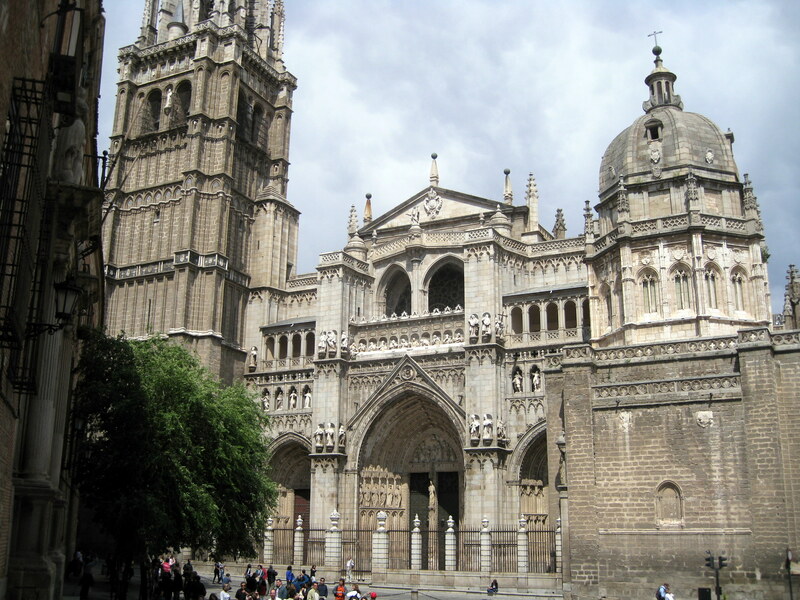 Toledo has remained the country's religious center. 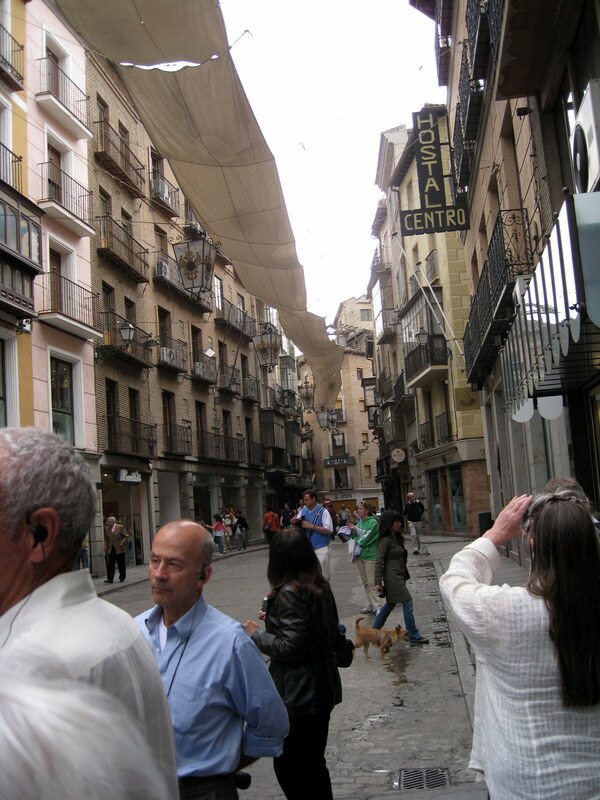 There were escalators from the area where the bus parked to the old section of Toledo. The escalators have a total length of 330 feet distributed along six sections that cover a height difference of 118 feet. They are distributed in a zig zag pattern that allows them to adapt to the terrain as well as a feeling of vertigo from affecting users. The escalators got us to the top with no problems. We then had a walking tour of the old town. Our first stop was the cathedral. 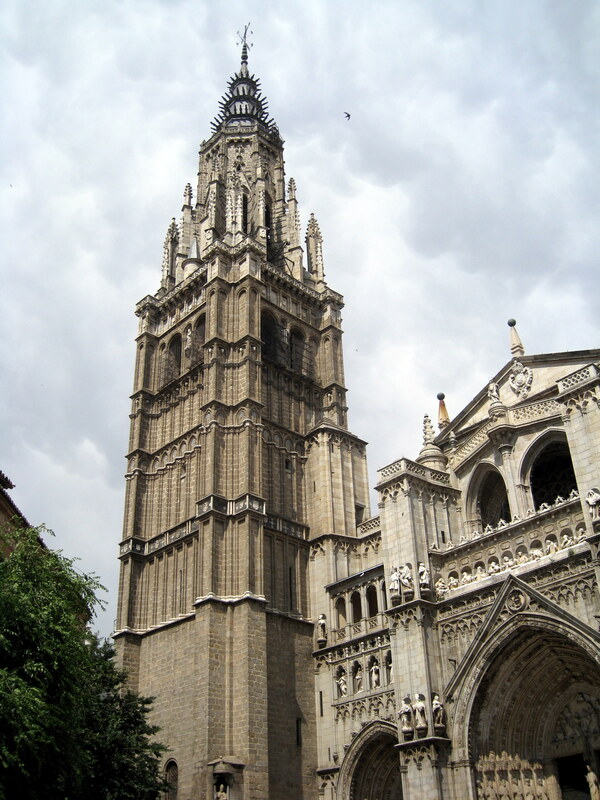 Ranked among the greatest Gothic structures, the cathedral actually reflects several styles, since more than two and a half centuries elapsed during its construction (1226-1493). 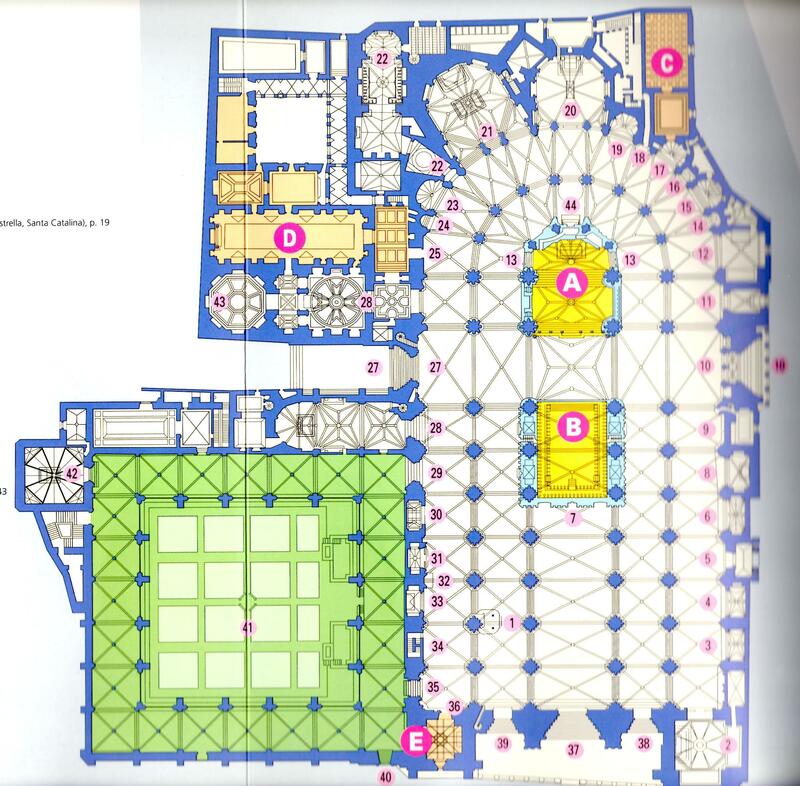 The floor plan below shows the typical Spanish interior design with a closed choir (#B) and the Sanctuary (altar area) (#A). Many historic events transpired here, including the proclamation of Joanna the Mad and her husband, Philip the Handsome, as heirs to the throne of Spain. Among its art treasures, the transparente stands out -- a wall of marble and florid baroque alabaster sculpture overlooked for years because the cathedral was too poorly lit. Sculptor Narcisco Tomé cut a hole in the ceiling, and now light touches the high-rising angels, a Last Supper in alabaster, and a Virgin in ascension. The Treasure Room has a 500-pound 15th-century gilded monst rance -- allegedly made with gold brought back from the New World by Columbus -- that is still carried through the streets of Toledo during the feast of Corpus Christi. Our guide, who was a knowledgeable young man, gave an excellent but too short of a tour. No photographs were allowed much to my disappointment so I can't show the beautiful interior. There were so many beautiful parts to be photographed. I wanted to buy my usual cathedral book, but the guide rushed us out and down the street. If I had stopped to purchase one, I might not have found our group again and I would still be there. Another disadvantage of an organized tour. Our next stop was the Church of Santo Tome. 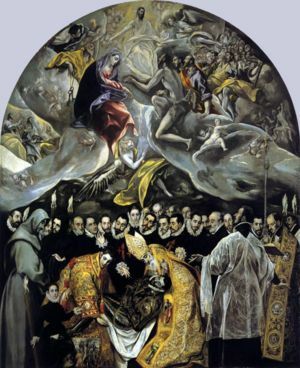 This little 14th-century chapel, situated on a narrow street in the old Jewish quarter, contains El Greco's masterpiece “The Burial of the Count of Orgaz”, created in 1586. We had read about this in James Michener’s book- Iberia. It was just in and out of there with no photographs. There was the nave of the church next to the painting, but we did not have time even to look in. We walked down the street to Sinagoga de Santa María La Blanca . In the late 12th century, the Jews of Toledo erected an important synagogue in the almohada style, which employs graceful horseshoe arches and ornamental horizontal moldings. Although by the early 15th century it had been converted into a Christian church, much of the original remains, including the five naves and elaborate Mudéjar decorations, mosque like in their effect. We then went back to the bus without a scheduled restroom break. Several of us desperate folks were able to find a small café across from where the bus was stopped. Another disadvantage of an organized tour. It was about an hour ride into Madrid. After we checked in, we departed for our final dinner which was one of the optional events. We ate at Los Cuevas del Duque. We went down into a cellar where there was one long table. We had a great dinner with hors’ oeuvres, sangria, wine, and salad. I had a leg of lamb and my wife had a suckling pig. Both were delicious as was the dessert. We had entertainment by three musicians – a guitar, mandolin and tambourine. They sang “happy birthday” to me as today was my 71st birthday. 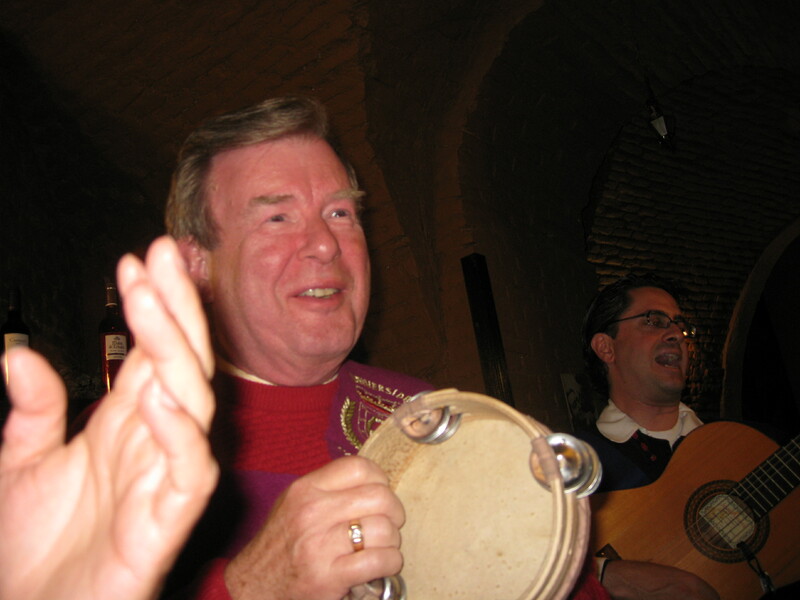 Then they gave me the tambourine to play for a whole number. I thought I was pretty good. I have been fortunate enough for the past three years to have my birthday in exciting places. I celebrated by 70th in Venice with a dinner on the terrace of the Ciprini Hotel overlooking the Guidecco, and my 69th in Cologne eating with a view of the Cathedral and attending the Cologne Philharmonic. The evening ended with a short ride around Madrid. We said our good byes to our group. It had been a wonderful and very congenial group. Even though we were not able to see some of the churches we had especially wanted to visit, it was a very good tour. Our tour guide, Kay, although not a native of Spain, knew Spain’s history and was able to give us a lot of information each day.